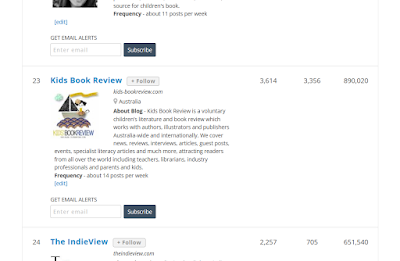 KBR is delighted to come in at no.23 in the Top 100 Review Blogs. What a huge achievement for what began as a humble little blog, and is now one of the best children's review sites on the web. Thank you to our fabulous, dedicated team--Anouska Jones, Jo Burnell, Sarah Steed and our tireless contributors past and present, for making KBR what it is today. The site could never have become what it is without you. KBR is run voluntarily by Australian children's book industry lovers and professionals, As ever, we are dedicated to bringing you the best books, across a broad range of genres, from baby board books to young adult fiction. We do this as part of our passion for great children's books--and sharing them with the world. We hope you are also enjoying our posts featuring authors, illustrators and other industry professionals, as well as our news and events. Don't forget to follow us on Facebook and Twitter! See the full Top 100 Review Blogs right here.